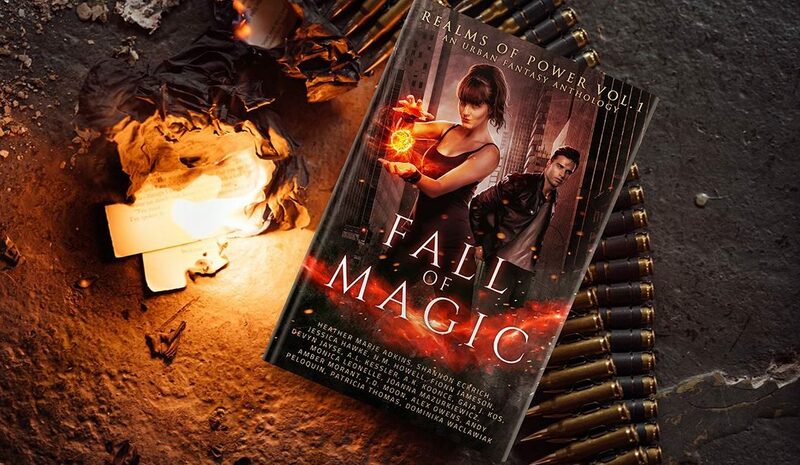 I’m so excited about my upcoming release, FALL OF MAGIC. I’m working with over a dozen fantastic urban fantasy authors to create a collection of action-packed, magic-infused stories. I’d love for you to take a look at part of the story! We leave at sunrise, with or without you. The words of the caravan leader echoed in Claire’s mind, filling the empty quiet between her pounding footsteps. Her chest tightened as she pushed herself through the lap—was this ten or eleven?—and focused on the words like a mantra to keep her going. If all went well, Claire Park would be living a whole new life twelve hours from now. One sunset, one sunrise, and everything would be different. No endless laps under the brutal sun. No more droning speeches at daily chapel. No more bland food and itchy school uniforms that smelled vaguely of stale sweat no matter how many times they were laundered. Beyond the walls of the Golden Rose Home for Girls was a world she longed to be a part of, even if it was frightening and unknown. She didn’t know where she’d go, but elsewhere was a good start. Her lungs burned with the effort of running the endless loop of red rubber track, but Claire didn’t slow. We leave at sunrise, with or without you. She pushed herself faster, as if she could catapult herself into morning that much sooner through sheer force of will. The running track enclosed a grass field in a gently sloping basin. Silver bleachers rose in a steep slope on both of the straight sides. Interspersed among the long metal benches were students studying, or at least making a show of studying while they daydreamed. Casting a long shadow over the track was a huge scoreboard with peeling white letters spelling out Visitor and Home. The words Home of the Mustangs were faded almost to nonexistence. Their teachers said the field had once been used for team sports called “football” and “soccer,” back before the Nightfall had upended the world. Seated in the grass encircled by one curved end of the track, a cluster of novices sat in a circle around their teacher. Judging from the pale blonde hair reflecting the light, the teacher was Sister Anne-Marie, one of the magic instructors. The students’ eyes were closed for meditation, faces calm and neutral in the warmth of the sun. Anne-Marie wielded a small mallet, occasionally tapping it against a large metal bowl. She struck it as Claire passed, sending a resounding echo into the air. The sound sent a prickling thrill down her spine. Further into the field was another group of older girls moving through the graceful gestures of a sun kata. The precise, stylized movements focused their energy and allowed them to wield the magic of the sun. Claire didn’t recognize the particular form they were doing, full of twisting hand motions and nimble turns. As the four students executed the steps in near-perfect unison, a great wheel of light formed around them, sending out sparks in a glittering rain. A spark of curiosity flared in her at the sight of the magic manifesting around the older students. Though a part of her wanted to observe and imitate their movements, she kept her focus on the narrow lane. Once she got out of here, she would have the time to learn the sun kata. On her own terms, not because a bunch of power-tripping sisters ordered her to with the looming threat of punishment for disobedience. Outside these gates, she wouldn’t have to give up her free study hour to run for an hour in the blazing heat because she made the same mistake in weapon combat class too many times. Or, if she was being honest, because she made a pointed comment about how silly it was to use a sword when she was already plenty skilled with a dagger. Claire was halfway through her thirteenth lap when a loud bell rang three times. The low sound triggered an instinct in her, prompting her to stop abruptly. As the third stroke evaporated into eerie silence, she stared at the edge of the grassy hill. The first red-orange streaks of sunset stretched over the horizon. The students practicing sun kata in the center of the field had already stopped, gathering their belongings as the glowing ring faded away. Likewise, the meditating group was already on their feet, likely having stopped in mid-sentence. Instead of finishing her lap, Claire cut across the field, merging into the stream of students headed for the steps that rose from the stadium and back up to the main campus. The evening’s first bell signaled one hour until sunset. Life at Golden Rose revolved around the sun’s daily cycle, as it did for all of those who didn’t align themselves with the darkness. Sunset always brought a frisson of nerves, an anticipation of the encroaching dark, but today found Claire extra nervous. Tonight, instead of the usual routine of dinner, nighttime lessons, and sleep, she would slip into the night and make her way toward a new life. Sweat trickled down her back as she climbed the long set of stairs on burning legs. She was surprised to feel a pang of sorrow at leaving the stadium behind. This would be the last time she climbed these steps on trembling legs, and last felt so strangely final. Claire ignored the murmured conversations around her, trying to avoid any distraction from her careful plans. When the stairs finally ended at a cracked concrete slab, she took a deep breath and waited for the burning in her legs to dissipate. Girls in their plain gray t-shirts trickled past her, instinctively banding together as they formed a solid stream toward the main building. According to the sisters, the Golden Rose Home for Girls had been a normal school before the Nightfall had upended the world. When the dark witches of the Tenebrae broke open the world like a fragile egg over thirty years ago, everything had changed. Lines were drawn, and magical gifts had become highly sought out by both the Tenebrae and the witches of the light, the Lumina. Whether they wanted to come, were orphaned by the fiends that lurked in the dark, or were ripped away from their families like Claire, girls and boys all over were taken to homes like Golden Rose to be trained to survive in a world of deadly darkness. Golden Rose was a center for girls, while the Murray House across town housed boys with magical gifts. Much of the original school building had been repurposed for the Lumina, but Claire and her classmates still found items with faded stickers reading Property of Barr’s Ferry High School. She and her friends had spent hours perusing the thick yearbooks stored in the library, marveling at all the activities and clubs that had once been a part of the school. Looking at all those pictures, it was impossible to imagine what life was like for those kids, living in world that hadn’t yet been shattered. The outer windows of the school all had heavy metal shutters hinged to the brick walls. They stood open during daylight hours, filling the classrooms and dorms with natural light. With sunset approaching, Claire and some of the other novices would begin their rounds to secure the shutters. Window duty was a critical assignment, and any mistakes resulted in a swift reprimand and punishment. Locked from the inside with keys only the adepts held, the windows blocked sound and light from outside. Stepping into the shade of the overhang along the side of the building was an instant relief after the afternoon heat. Wiping sweat from her face, Claire headed through the open double doors. Just inside, thick planks of wood leaned against the walls to bar the door once the building was secured. The planks were inscribed with runes for additional protection. A quiet buzz filled the long, cinderblock hallways. The air was warm and still, barely cooler than inside. Power to the main building would resume closer to sunset; during the day, only the administrative offices, the kitchen, and the infirmary were powered. For the rest of the building, power was limited to certain times of day, and even then was minimal. Early dinner had already begun in the cafeteria, judging by the eggy smell wafting through the humid hallways. Her stomach rumbled with hunger, but her plan relied on tying up loose ends and getting out before sunset, so there was no time to stop and eat. Claire bypassed the cafeteria, heading for the hallway where she shared a room with nine other girls. As she walked, the burden of her plan draped like a heavy cloak on her shoulders. Every quick glance felt like an accusation, like everyone knew she was up to something. But most of the girls seemed engrossed in their own conversations, ignoring her entirely. No one even spoke to her on her way to her room. Room 404 was the place Claire had called home for the last four years. Well, “home” was a bit of a stretch. She still thought of the little green house by the lake as home, even though she hadn’t been there in almost a decade. Too small to know the street name or even the state she’d lived in, all she remembered was the mint green siding and bright purple blooms in neat, well-tended flower pots on the front porch. Those damn flowers were burned into her memory, the last image she had of home before the sisters of the Lumina took her from her mother. Room 404 was a place of familiarity and function, not fondness. Five sets of bunk beds and dressers were crammed into Room 404. No pictures or decorations adorned the stark white walls. Each bed was made neatly to the sisters’ specifications; dingy grayish-white sheets pulled perfectly tight over the narrow mattress, pillow centered at one end, blanket folded at the foot of the bed. The corner space was nothing worth getting excited about. The Lumina believed personal belongings created unhealthy attachments. Most of what filled the shared dresser was clothing, toiletries, and a few personal items secreted under folded pajamas. The only other occupant for Room 404 was Terra, one of the younger girls, who was presently on all fours searching for something under her bunk. Claire ignored her, digging through her drawers for a set of clean clothes. Tucking them under her arm, she grabbed her basket of toiletries and hurried to the gym. The showers were already full with other girls who’d had the same idea to forgo an early dinner in favor of getting a hot shower while the water lasted. They must have had their lessons inside, which gave them a head start on all the girls who’d been outside when the first warning bell sounded. Claire would have been inside with them, reading in the library instead of running laps, if not for Sister Danica’s unfair punishment. Claire shifted uncomfortably as she leaned against the wall to wait her turn. She’d been in line a few minutes when one of the older girls, Nash, shouted, “Hurry it up, freshies!” Her voice echoed off the walls, eliciting a chorus of shouts back. It wasn’t unusual for one of the older girls to get impatient and reach past the curtain to turn the shower off, so it was in everyone’s best interest to keep things moving. The showers opened in waves, with four or five girls emerging at once wrapped in towels. Though she made a point not to stare, Claire couldn’t help but notice the marks and scars some of them bore. There was Pippa, who had the telltale rough pink scars of a terrible burn all down her right side. She was still relatively new to the school, and she’d worn long sleeves every day since she arrived, even in the height of summer. Zara had four parallel claw scars across her back, partially covered by her thin white towel. Claire had seen her when they went swimming earlier in the summer. The marks went all the way down her back and across her hip. Something had nearly made a meal of Zara, and presumably her family, which was how she’d ended up here. Some of the girls here could be mean as snakes, picking on everything from someone’s hairstyle to the size of their feet. Among other things, Claire had been mocked for her eyebrows, her pronunciation of the word pecan, and being abnormally sweaty, as if anyone would be fresh and dry after running three miles in under twenty-one minutes. Despite that, virtually no one made fun of another girl’s scars. There might be pointed, borderline inappropriate questions, but few would mock the outward reminders of their common nightmare. Others were like Claire—relatively untouched, but still here under less-than-ideal circumstances. The Nightfall had unleashed a host of dark terrors and predators upon their world. While there were precautions to be taken, like the heavy shutters on the windows, those weren’t enough. In the aftermath, the Order of Lumina had formed to train people born with the gift of magic…whether they liked it or not. Claire showered quickly, scrubbing away the sweat of the evening’s exercise. After washing her long, dark hair, she twisted it into a knot atop her head, then reached through the narrow slit between wall and curtain for her towel. Tying it carefully around herself, she vacated the shower to avoid the ire of the older girls. As she maneuvered her wet feet into a pair of rubber flipflops, another loud bell sounded. This one was amplified over the building’s intercom, echoing off the walls. Conversations halted as everyone glanced upward. “Crap,” one of the girls at the mirror said. She swiped a hand through her damp, unruly red curls and scooped up her basket of toiletries. Claire paused to let her pass, scanning the room. Conversation resumed in the wake of the announcement, and things appeared utterly normal. For everyone else, it was just another night. With her shoes squeaking against slick tile, Claire hurried to the changing area and plopped down on a wooden bench. This was the last time she’d shower in the big, humid room that smelled like bleach and a hint of floral perfume. Maybe she’d find a place where she could have her own shower and take as long as she wanted without someone yelling for her to hurry up. The thought made her smile. Claire pulled on a pair of snug dark capri pants and a black tank top. Leaving her hair in a messy knot atop her head, she hurried back to her room to finish preparations. “Close the door,” Data said. She took a pencil from behind her ear and stuck it into the textbook before closing it. When Leslie had left the room, she looked up at Claire expectantly. Data held up the textbook for her perusal. The slick purple-toned surface featured a smattering of mathematical symbols. Claire only recognized the strange symbols from proximity to her math-fascinated bunkmate. Data’s real name was Priscilla, but one of the senior girls had mockingly given her the nickname almost five years ago in an attempt to humiliate her for reading a math book at breakfast when everyone else was socializing. Claire had tried to defend her friend, but Data shrugged off the insults. Staring up at the girl, who stood a foot taller and was easily the strongest girl at Golden Rose at the time, she’d been unafraid and unbothered. “It’s a lot better than Priscilla. Thanks,” she’d said with an enthusiastic nod. With a shrug, she’d gone back to reading her book, leaving the older girl dumbfounded. The sisters refused to use it, but all the novices called her Data, creating some confusion in lessons when a teacher would call for Priscilla. “So you’re doing it tonight,” Data said, setting the book aside. She still wore the same neutral expression. “Yes,” Claire said. Well, there it was. “I’m not having this whole conversation again,” Claire said. “I guess I thought being friends for ten years made us family,” Data replied, her eyes creasing with a hint of pain. Her best friend could throw a punch when she wanted to, but she managed to knock the wind out of Claire with a single statement. It wasn’t like she wanted to abandon Data. It had already taken every scrap of courage she had to tell her friend she wanted to go. Next to the dresser was a tall wardrobe that held their few hanging garments. Claire’s well-worn dark gray coat was inside, a piece she’d claimed when some of the older sisters showed up at the school with boxes full of secondhand clothes. Its elbows were worn and its lower hem somewhat frayed, but it was in good condition otherwise. She had sewn in five pockets from mismatched dark fabrics. Two long ones had been cut from a rough nylon; they were just the right width and length for the forearm-length daggers Claire trained with. She pulled down the coat and tossed it onto Data’s bed. Her bunkmate frowned, picked it up, and hung it instead from the corner post of the bunk bed. “This isn’t about numbers,” Claire said. “They said they’d pay me to do house sealings,” Claire said. Though the plan had seemed solid, it sounded flimsy when she said it aloud. There was always a demand for those who could perform a house sealing ritual. All homes had innate protection from demons and other denizens of the night, but those protections could be weakened by frequent attacks. It was also becoming popular to add wards to businesses and other buildings that weren’t technically houses. Though Claire hadn’t been angling for the sisters’ favor, she’d picked up the sealing ritual faster than any of her classmates. She’d even gone along with Sister Anne-Marie to help seal a few shops downtown. Anne-Marie had supervised and checked behind her, but Claire had done all the work herself and gotten the sister’s silent approval. “How much are they keeping?” Data asked. “It doesn’t matter,” Claire said. “So it’s freaking dangerous out there. Even if it wasn’t, you still belong here with us,” Data said. Claire felt like she’d been slapped in the face. Her cheeks heated as she quietly took her small backpack from the bottom of the wardrobe. “You don’t have to be mean,” she said as she quickly piled her underwear and a few of her uniform shirts into the bag. Many of the girls kept their stories quiet; sharing how they’d come to the Lumina was a sign of deep trust. Data’s parents had been possessed. Like so many others, they’d been lured into the night by the subtle whisperings of dark creatures. Leaving the safety of their own home, they’d been taken into the night and never returned. She was barely three when a neighbor found her crying alone in the front yard. Data had spent two years in a regular orphanage, and when she’d showed her first hint of magic, that pesky little spark, she’d been taken to the closest Lumina House. But Claire had been taken away, not rescued. She barely remembered it now; she’d realized that the little wisps around her weren’t quite normal when she saw the look on the babysitter’s face. The small golden butterflies fluttered around her, their bodies made of pure sunlight. It was beautiful, but the babysitter looked sad, maybe even scared. Her mom’s face had been shocked when she came to take her home that day. It had only been a few days later when the sisters of the Lumina came and stole her away, claiming her power for their own and ripping her away from her mother and older brother.